Two young men have been shot dead during a student protest in Chile. The victims were named as Exequiel Borbaran, 18, and Diego Guzman, 24. Both men were killed in the port city of Valparaiso, said Interior Minister Jorge Burgos. Local media report that they had been spraying graffiti on a wall and were shot by the son of the owner of the property. Students held protests across Chile on Thursday to demand education reform. Chilean police said they had arrested a 22-year-old suspect over the killings. "The government does not tolerate and will not tolerate these acts of violence," said Mr Burgos. Reports say that an argument ensued after the two men were seen spraying graffiti on the wall of a residential building. A man came out to try and stop them, threatening to kill them if they did not leave. He went back inside to get his gun and shot them both. Both victims were rushed to hospital but died of their injuries shortly afterwards. Students said they would hold a candlelit vigil for the the victims later on Thursday. 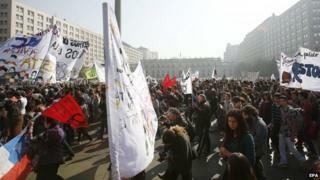 The protest in Valparaiso, 130 km (80 miles) northwest of the capital Santiago, was one of several across the country. Students have staged dozens of marches since 2011 in a bid to change Chile's education system. The BBC's Gideon Long in Santiago says that many of these marches end in violence, with masked youths fighting with police who respond with tear gas and water cannon. But until Thursday, only one person had been killed. A 14-year-old boy was hit by a police bullet during in 2011.